See The Updated version of this map here. Adventure Map Version of this map found here. Complete with a Nether boss battle!!! Our fist map. 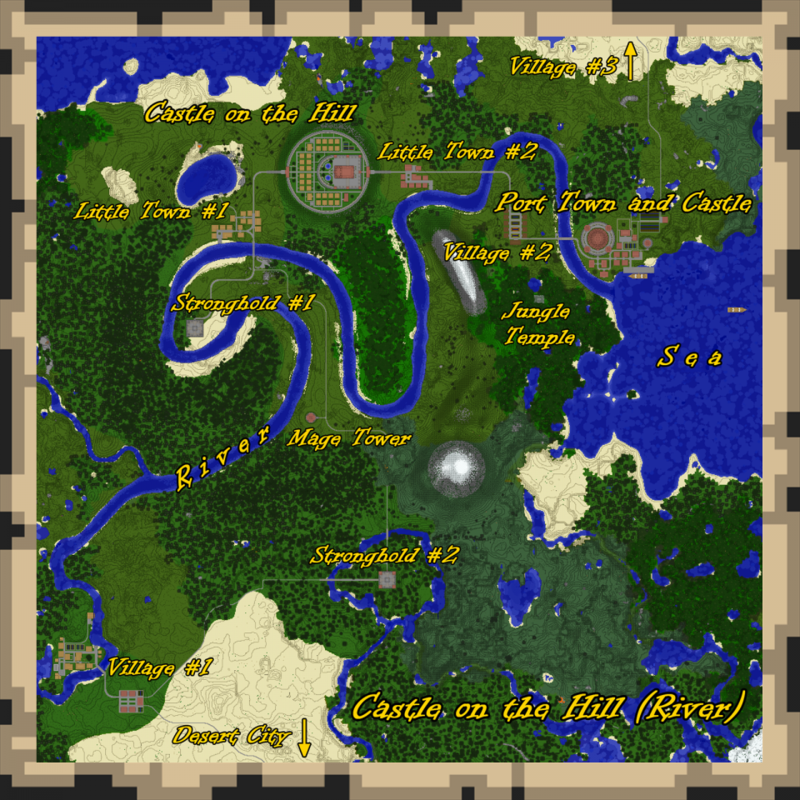 Features a Large unfinished Castle (most of which was made in Alpha and updated during beta) with working portcullis a dragon, throne room, king and queen rooms, guard barracks, archery range, ship, Large mine shaft, an Ent (lord of the Rings), large Tower building and lots more to explore. All is a work in progress. Another large Update on my first map. BEST VIEWED with the John smith Texture pack. -A Much larger sailing ship (same as the preview map). -Worked 2 sides of the castle bringing them much closer to completion. -New import office, guard positions and beds. -New duty free stand outside castle walls. -Some of the smaller houses are furnished (all different). -miner's Guild center, housing, and miner's Pub. -working "actor raising platform" (what ever they are called) in the theater. First off BEST VIEWED with the John smith Texture pack. This Update will be the last non-adventure map update unless a completed non-adventure map version is requested. I plan on making this map an adventure map after the release of 1.3. This map is created by one person, Me. This map was made with out help from bukkit or the like. There was some minor MCedit used for importing other creations outside main castle from older maps though. This map started off as survival(no cheating) till creative mode was made. This map also contains many red stone contraptions including various secret tunnels, hidden passageways, and several working portcullis. This map contains monuments, statues, ranges, training areas, soldier barracks, libraries, laboratories, a royal theater, palace, Shops, an upper level and lower level, apartments, houses, imports offices, sailing ships, a light house/ monument, a mine shaft, farms, underground farms, towers, a church, a graveyard, various crypts, and Tons more. -New Underground shopping and apartments. -New Ramen shop in the upper level. -Dragon skull added to palace main entrance. -Added several crypts outside castle walls. -New sewer pump station in the upper castle (for looks). -Various changes and tweaks. More than I can remember.